Blue skies, deep blue seas, tropical islands – they’re all featured in Playtech‘s fishy offering, Dolphin Cash. It’s a great looking online slot that will leave you wanting to dive into the sun-kissed water, swim with the dolphins and of course leave with a profit. 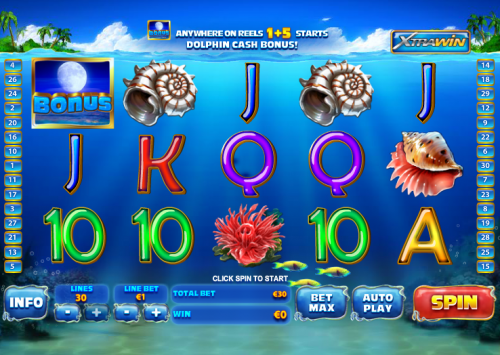 Dolphin Cash is a five reel and thirty payline slot which features some lovely graphics and animations. The low value symbols are Playtech’s standard playing cards but the high value symbols are a variety of underwater creatures, large shells and a seagull. The dolphin itself is the wild symbol, the scatter is a Dolphin Cash coin and there’s also a bonus symbol which is a full moon over the water. This short game is triggered by landing two of the moon bonus symbols on reels one and five and in our experience it happens quite frequently; you will be taken to a different screen with an arc of coins above the water and the dolphin swimming about underneath. All you have to do is click the ‘Jump’ button and the dolphin will leap out of the water and grab some coins. Occasionally a seagull will fly across as well and grab a few more. One of the pleasing animations in the game is the Shifting Wild dolphin; if the symbol appears on reel five it begins a sequence of jumping to the reel to the left with each spin, adding a handy wild to that reel. After five spins it leaps off to the left and the feature ends. It’s also worth noting that if it lands on a scatter or bonus symbol for example, that symbols will still be active. 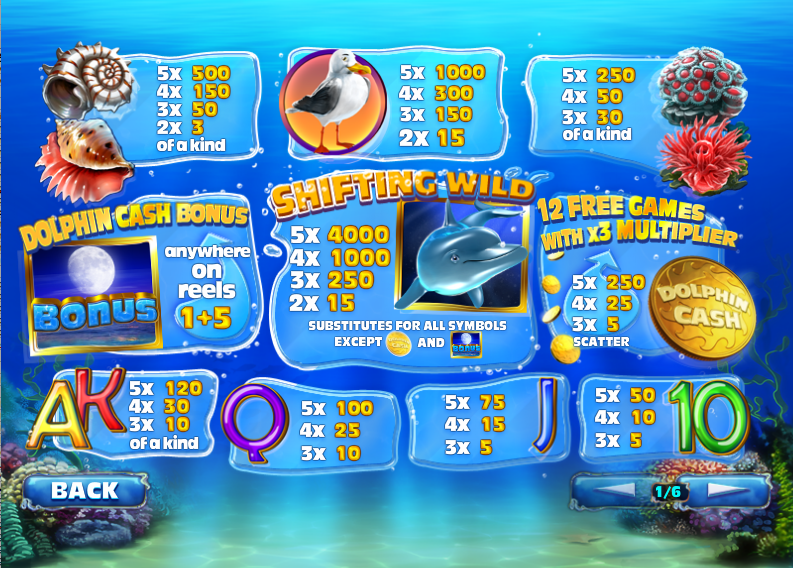 Land three Dolphin Cash coins anywhere on the reels and you’ll be rewarded with 12 free spins for your troubles. This bonus game can’t be re-triggered but the Shifting Wild can occur, though unfortunately it won’t be carried over back into normal gameplay if the dolphin hasn’t reached the left hand side. Xtrawin is an optional feature which you can activate by clicking the Xtrawin button; it costs an extra 50% of your current stake but landing a Shifting Wild on reel five will create one more either above or below it, doubling your chances of creating winning combos. This is a great looking slot with a decent selection of bonus features and some top notch animations. Well worth a few quid of anyone’s money. The minimum bet is €0.20 per payline and the maximum is a hefty €15,000 per spin.